Approximately fifty million years ago, I was given a tub of Lush's Fair Trade Foot Lotion (as Pink Peppermint was then known) at an event. At the time, I had heels that were so cracked, they were literally bleeding (TMI soz) but once I started using this foot cream every day, it was like they'd been healed by a wizard. I was so excited by the success of this Lush foot cream that when I saw a different one- Pied de Pepper- pop up in the Kitchen, I pounced on it. What I hadn't counted on was just how long the first pot was going to last. I used it every single day for over two years before it finally ran out and had started to think I wasn't going to even start Pied de Pepper until after it had expired. As it turns out, I got there with about two months to spare but I'm not one to take expiration dates as gospel. So long as it's not mouldy or stinky, it's all good if you ask me. Good thing too as this pot is threatening to take just as long to use up! 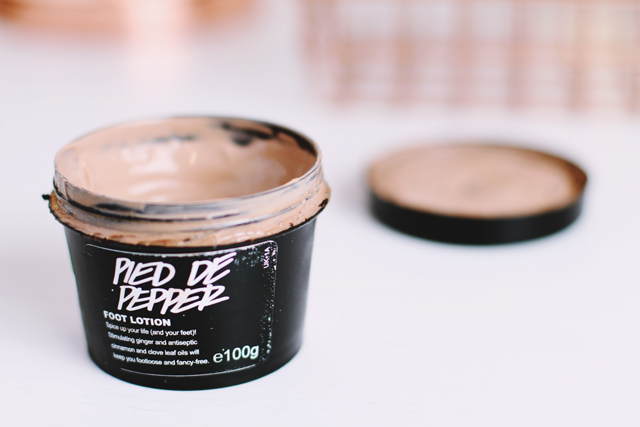 Like most of Lush's foot creams, Pied de Pepper is packaged in a recyclable black pot (for some reason, Softy comes in a bottle instead but I'm not sure why this is). Unlike other products though, I've found Pied de Pepper has a tendency to leak a bit more. I think this is because the cream itself is more fluid than others, so it's easier to squidge over the side when you twist the lid back on. The lotion itself is of a pink-toned clay colour but be warned: It has a tendency to leave horrible brown stains on fabric. Since I apply it to my feet at night, the bottom of my bedsheets are now speckled with these nasty-looking marks. 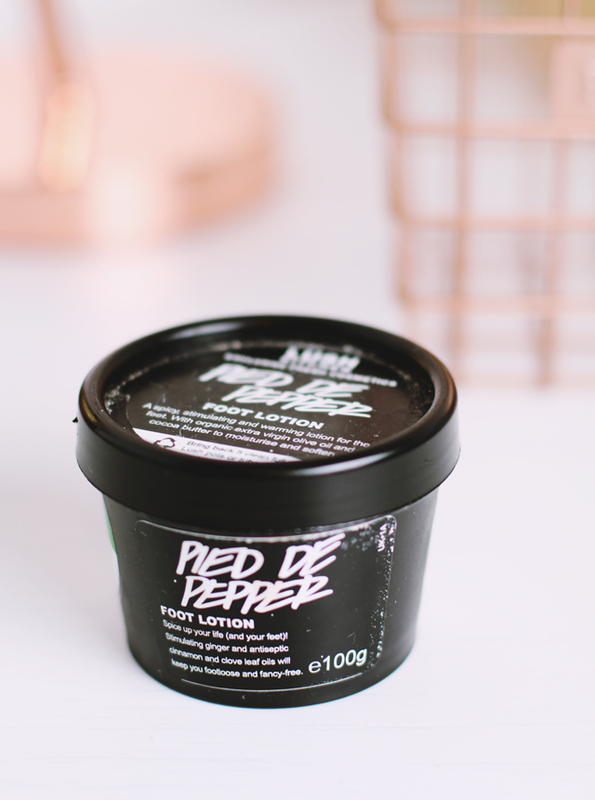 The description on the product listing promised Pied de Pepper was spicy, stimulating and warming with ginger, cinnamon and clove so I envisioned a proper festive fragrance like a Christmas party on my feet. Unfortunately, it's nothing like that. Yes, it's spicy. Yes, you can smell the ginger, cinnamon and cloves but ultimately it creates a more earthy, masculine spicy scent, rather than the more fruity spice you might expect. It's not unpleasant per se, but it's not something I'd have picked up if I'd sniffed it in-store first. As I mentioned earlier, the cream is thinner than most others, so it spreads around the foot easily but doesn't seem to absorb as well as the others. Despite this, a little goes a long way so I'm sure this pot is going to last forever too! You know what? Pied de Pepper has worked just as well as Pink Peppermint did. With daily application, my feet are smooth, moisturised and no longer bleed when I walk! However, if I'm going to get these great results from a foot lotion that smells far nicer and doesn't leave horrible residue on my bedsheets, there's not really a reason to repurchase this. There's no denying it works but I'd recommend the far superior Pink Peppermint instead. It's pink, it's minty, it's available whenever you need it. Just buy the smaller pot because it will last forever. I have recently jumped on the Lush train and have been super impressed so far. I think I'll get the mint foot cream you recommend- winter is here so I will definitely need it!